Disney Pixar Fest promises to delight fans of all ages with new and classic experiences that allow us to see and interact with those characters we all know and love. With 19 films, 13 Academy Awards and 11 Grammy Awards the Pixar characters have touched our hearts. Boys and girls, kids and adults all love and connect with these films and the Disneyland parks bring the characters to life. Time for this experience is limited to this summer from April 13th through September 3rd. • Pixar Pals Celebration at Paradise Gardens with a musical Troupe & Charter Encounters. • Continue to enjoy Cars land, Toy Story Mania & Monsters Inc, Bugs Land etc. Also enjoy new Pixar themed food, beverages & merchandise at this summer long celebration. As if any of us needed another reason to visit Disneyland. Let me help plan the details of your Pixar Adventure! Which hotel/cruise ship is the right fit for your family? Where to dine, attractions, crowds and all that goes along with planning a vacation is a lot to think about. With a Disney-focused travel agent by your side, you can plan as much or as little as you desire. My planning assistance all comes at NO additional cost to you and is based on countless hours of personal experience. • MaxPass. Confused about MaxPass? Should you pre-purcahse it? What does it include? I can help you figure out what might best suite your family vacation style. • Itinerary plans and printed detailed itinerary. • Fee-Free Planning. All of my assistance comes at no added cost to you. I book directly through Disney and never charge a service fee. When you book your trip through me, you will get all of the services that Disney offers, plus the personalized service that I offer. • Help planning visits to other area attractions outside of the Disney theme parks. If you are considering adding other Orlando attractions to your vacation. California Screamin’ will become the new Incredacoaster along with other changes that have re-themed the back of the Disneyland park into a Pixar Pier. This area was an obvious choice for Disney to transform as they expand their Pixar presence in both Disneyland and Walt Disney World. With the popular Toy Story Mania attraction already in the location, the theme of the area practically lends itself to Pixar. “As Disney Parks Chairman Bob Chapek announced at D23 Expo Japan, Pixar Pier will open June 23, 2018 at Disney California Adventure® Park. This reimagined land will feature four whimsical neighborhoods representing beloved Pixar stories with newly themed attractions, foods and merchandise. Guests will enter Pixar Pier through a new marquee, pictured above, which will be topped by the iconic Pixar lamp later in the year. The June 23 opening of Pixar Pier will also include the Incredicoaster – a super combination of character figures, lighting and special effects that will bring the Parr family racing alongside you in a high-speed adventure. Also coming in June is a dazzling new float for the popular “Paint the Night” parade featuring Mr. Incredible, Elastigirl and Frozone from “The Incredibles.” This new float will bring all of the fun and excitement of the Incredibles’ world to life with high-tech, pop-art effects inspired by the mid-century-modern style of the films. Dynamic and innovative visual technology will also bring Violet, Dash and Jack-Jack to life, showcasing their powers in surprising ways! • Help planning visits to other area attractions outside of the Disney theme parks. If you are considering adding other Orlando attractions to your vacation, why not get assistance of someone who is local and been there? 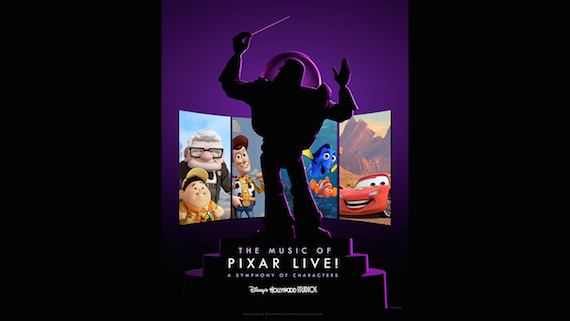 This summer at Walt Disney World® Resort, Disney’s Hollywood Studios® will present “The Music of Pixar LIVE! A Symphony of Characters.” This limited-time concert event will showcase memorable music from Pixar Animation Studios films, complete with a live orchestra and appearances by beloved Disney•Pixar characters. Starting May 26, 2017, “The Music of Pixar LIVE!” will be presented three times nightly at Theater of the Stars at Disney’s Hollywood Studios (following the regular daily performances of “Beauty and the Beast – Live on Stage”). The show will also feature highlights from some of Pixar’s greatest scores, from films like “Toy Story” to “Cars 3.” Guests can also expect appearances by Woody, Jessie, Mike and Sulley, the Incredibles and more. Stay tuned to Disney Travel News for more information on this show. Thank you for reading. My name is Melissa and I am a Disney addict; I’m also a travel agent. You will find me almost every weekend in one of the Disney World parks with my family enjoying the newest attractions so I can help my guests plan. All of my planning services come at no additional cost when you book your Disney vacation through me and it all starts with a free, no obligation quote.